This is the first in the HELISKI.com Series on how to select the best heliskiing trip. British Columbia Canada is the center of the heliskiing world. It has the perfect combination of terrain, climate and precipitation. 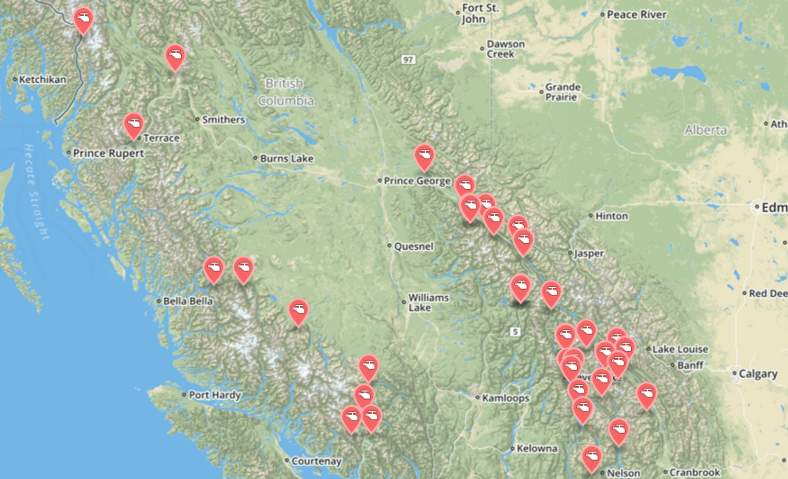 It is home to the majority of heliskiing and heliboarding operations on earth – over 90%. Within British Columbia there are different regions with different advantages and disadvantages. Snow quantity is directly affected by proximity to the Pacific. In general, more snow falls in the Coast Ranges. Many operators report receiving the most snow in January and the least in March. Snow quality is based on a combination of factors, but most notably is the distance North (cooler temps) and the elevation (the higher the dryer). A minimum amount of snow is required for both ground coverage and general stability and for this reason the vast majority of Heliskiing occurs in the Interior ranges and the Coast Ranges. The Rockies generally receive less snow fall, but the snow tends to be lighter. Terrain varies within and among mountain ranges. Steep, trees, bowls and high-alpine cruisers can be found most places. But many operators tend to offer a predominance of a particular type of terrain. Let us know what you prefer, and we can offer feedback on the ones we have visited….which, luckily, is most! but there are a couple in Haines, and some outliers. Alaska can be more difficult to access. For example, Anchorage to Valdez flights are cancelled over one third of the time in the season. Alaska can have more down days than many BC operators. There are some options better than others. The United States mainland offers heliskiing and heliboarding in the Lower 48 as well. Utah, Colorado, Nevada, Washington and Idaho all have heliskiing. Many of these are located at or near resort skiing and cater to one-day trips, although longer trips are also available. Rest of the World. Europe heliskiing is somewhat restricted, starting late and ending early. France outlawed it. More eccentric locations include Russia, Turkey, Iceland, Sweden. ‘Summer’ locations include Chile and Argentina in South America. Australia and New Zealand also offer some limited heli skiing. email tj at HELISKI.com or answer 4 questions, or Skype HELISKI.com.